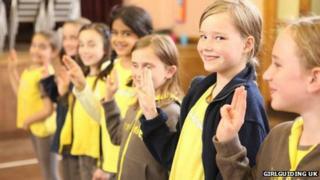 Girls will no longer have to pledge their devotion to God when they join the Guides and Brownies in the UK. It comes after a consultation found a new Girlguiding UK promise was needed to include "more explicitly" the non-religious and those of other faiths. They currently vow to "to love my God, to serve my Queen and my country". The new oath drops the reference for the first time since Guides began in 1910 and will see them promise to "be true to myself and develop my beliefs". The revised wording from September will also see members of the 540,000-strong organisation promise "to serve the Queen and my community". The consultation earlier this year involved nearly 44,000 Girlguiding UK members and non-members. Chief Guide Gill Slocombe said: "Guiding has always been somewhere that all girls can develop their beliefs and moral framework, both inside and outside the context of a formal religion. "However, we knew that some people found our promise confusing on this point and that it discouraged some girls and volunteers from joining us. "Guiding believes in having one promise that is a clear statement of our core values for all our members to commit to. We hope that our new promise will allow all girls - of all faiths and none - to understand and feel proud of their commitment." The promise has been changed 11 times in the organisation's history, most recently in 1994 when the long-standing phrase duty to God" became "to love my God" and "serve the Queen" was supplemented with "and my country". The British Humanist Association (BHA), which gave a response to the consultation, welcomed the change, noting it was the first version of the oath to "open guiding up fully to non-religious girls". BHA Chief Executive Andrew Copson said: "The new promise is about personal integrity and ongoing and active self-reflection, both of which sit well alongside a sense of responsibility to others and to the community." Stephen Evans, campaigns manager at the National Secular Society said: "By omitting any explicit mention of God or religion the Guide Association has grasped the opportunity to make itself truly inclusive and relevant to the reality of 21st century Britain." The Church of England was among the groups which had urged Girlguiding UK to keep the reference to God in the promise. In December last year, the UK Scout Association announced its own consultation to see if its members would support an alternative Scout Promise for atheists, who are unwilling to pledge a "duty to God". And in July 2012, the Girl Guides in Australia dropped their allegiance to both God and the Queen, agreeing to serve their community and be true to themselves instead.